Minnesotan Chad Corrie’s written everything from horror and sci-fi to contemporary fiction and poetry, plus screenplays, stage plays, and just about everything else you can imagine. 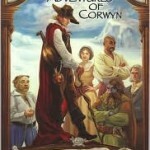 His latest book is The Adventures of Corwyn a series of fantasy short stories illustrated by Tiffany Prothero. Chad will be taking part in a presentation and discussion about graphic novels and their creation at 1 p.m. on Thursday, July 30th at the Galaxie Library, 14955 Galaxie Ave, Apple Valley, MN. Presently I'm working on catching up with the recent series of disasters that have taken place in the DC Comics multiverse. I've made it up to the final two graphic novels in the Countdown to Final Crisis series and just have a little bit more to go. Don't know if that's an official “book” but it's the fiction I'm reading right now. No, not really. I've enjoyed some characters buy never really had a “crush” on them. I don't know if I have a favorite author but one who I've liked in the past is Robert E. Howard. I suppose if he did pop into town and was alive and well (since he died in 1936) I'd look at some place like Brit's Pub. I'm not really a drinker but we could get some Shepard's Pie and get caught up on that nice grassy roof they got going on up there this time of the year. Again, I don't really know that I have a favorite book. I do have some ones I enjoyed and I recall with some fond memories. I recall reading Stephen King's The Cycle of the Werewolf when I was about twelve. I had to sneak it home from the library cause my folks thought I was too young to get into his work. It was my first real book I read too-probably because of the pictures inside. Death in the Family, the graphic novel in which the second Robin dies, was a fun read too. I guess there's something just wicked that needs to be appeased inside young kids when they see the hero bite the dust and the bad guy win for a change. Most of Weis and Hickman's books have been enjoyable as have many of Robert E. Howard's tales. Well in some ways you can argue parts of it are already here and will be here until the end of time. If I had to “become a book” I can think of nothing more fitting than the Bible. That's a hard question to answer because #1 I'm not dead yet, and #2 not everything to be written has been written yet. There could very well be some incredible work out that that is just about to dawn between now and the time my corpse is put in the ground so I can't say for certain what that book or those books might be as of yet. I'll be keeping my eyes open, however.